The Royal Enfield sign is up on the new North America flagship store. 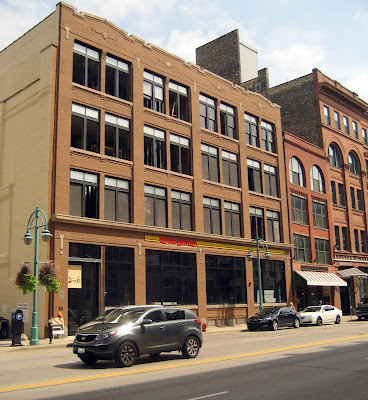 The recent Royal Enfield North America email newsletter invites you to "be on Water Street in Milwaukee’s Historic Third Ward for Royal Enfield’s 'Return to Pure' Grand Opening Party. "Be there for the launch of the first Royal Enfield flagship store in North America, Royal Enfield of Milwaukee, with music, food, drink, motorcycles, moto personalities and more. Keep an eye out for dates, details and your exclusive invitation." 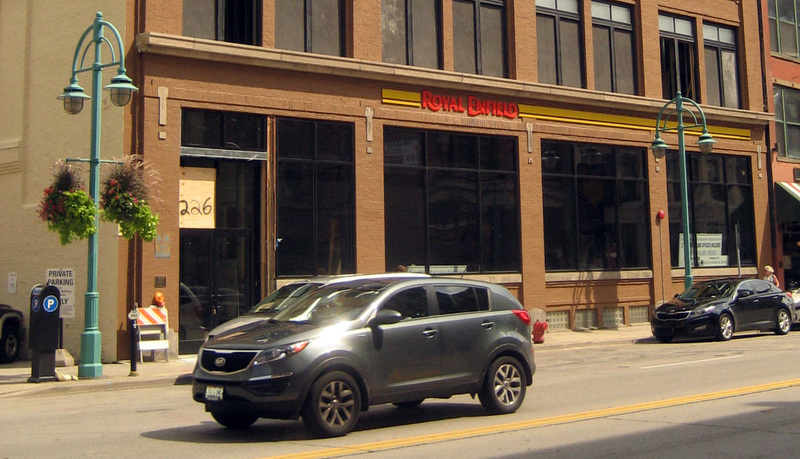 The newsletter is already using the address of the coming flagship store and North American headquarters, at 226 N. Water St., Milwaukee, Wis., although the building is not yet occupied. Reader John Donlon recently journeyed to Milwaukee and photographed the building. It's a hundred-year-old building in an historic area of the city. The "Royal Enfield" sign is visible, but so are signs that rehabilitation of the structure continues. Historic 1914 era building once housed a paint factory. "The building is mid-block on the east side of the street and for better or worse has a historic building plaque affixed to it. Basically that means no alterations are allowed to the exterior that alter the building's historic character," John observed. "The north side of the building has been recently painted and the front (facing west) looks as though it has received a good cleaning. The entire interior (notice all the open windows) is undergoing a gut rehab... but the first floor appears from street-level to have extensive work going on in the entire space. 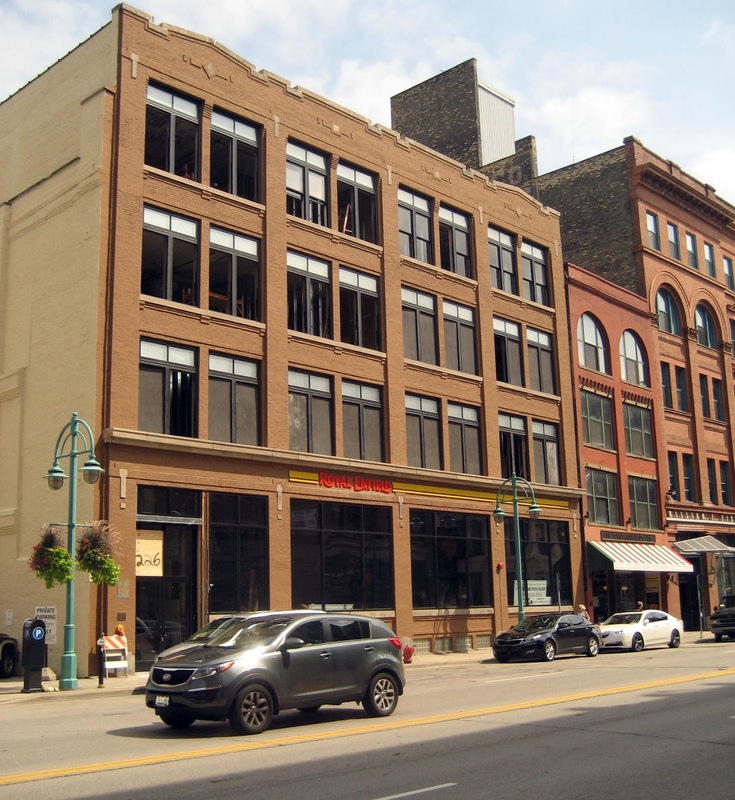 "This neighborhood wasn't worth a damn 10 years ago but now is a Milwaukee version of Chicago's Printers Row (Dearborn Street between Congress and Polk) and the rehabs for loft condos and new construction are going like gangbusters. Water Street needs to be repaved and some serious sewer work is occurring about a block away on Chicago Street. "I can see in two or three years this being a very high end area..." John wrote. Watch the newsletter for the Grand Opening date. You can subscribe to the official Royal Enfield email newsletter at this link.